LONDON--(BUSINESS WIRE)--The global mobile apps market is expected to post a CAGR of close to 18% during the period 2019-2023, according to the latest market research report by Technavio. A key factor driving the growth of the market is the growing m-commerce industry. The m-commerce market has witnessed exponential growth in recent years, owing to the increasing focus on mobile-aided shopping. Mobile phones provide enhanced flexibility for users as they enable not only product choice but also browsing flexibility to customers. The growing adoption of m-commerce apps in mobile phones is allowing marketers to employ omnichannel marketing strategies. Thus, numerous retailers are adopting a mobile-based approach to boost their sales, which will lead to growth in the number of mobile-based m-commerce apps. This will drive the global mobile apps market during the forecast period. This market research report on the global mobile apps market 2019-2023 also provides an analysis of the most important trends expected to impact the market outlook during the forecast period. Technavio classifies an emerging trend as a major factor that has the potential to significantly impact the market and contribute to its growth or decline. “The focus on developing innovative AR/VR-based mobile apps is increasing worldwide. The AR-based mobile apps function based on real-world scenarios, superimposed with computer-generated graphics to provide a composite view to the viewer. AR-based apps provide a highly immersive experience to their users. Thus, they are highly popular across all electronic devices like smartphones and tablets,” says a senior analyst at Technavio. This market research report segments the global mobile apps market by application (entertainment, social networking, finance, and healthcare) and geographical regions (APAC, EMEA, and the Americas). The entertainment segment led the market in 2018 with a market share of over 46%, followed by social networking, finance, and healthcare respectively. However, during the forecast period, the finance segment is expected to register the highest incremental growth, followed by the social networking segment. 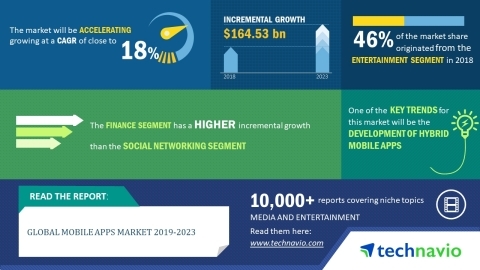 The global mobile apps market is expected to post a CAGR of close to 18% during the period 2019-2023, according to the research report by Technavio.